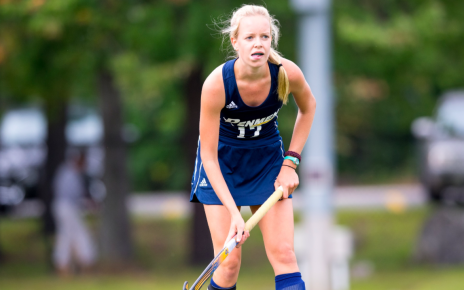 Sophomore Molly Terry (Shrewsbury, Mass.) and freshman Sarah Deyo (Attleboro, Mass.) 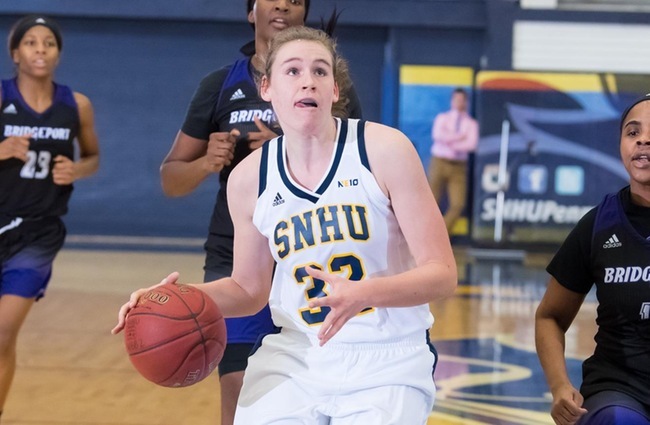 both submitted career performances, but it was not enough, as the Southern New Hampshire University women’s basketball team lost to Adelphi University, 78-69, Tuesday evening at the Center for Recreation and Sport. Terry poured in a career-best 21 points (7-9 FG, 4-5 3-FG, 3-3 FT), to go with four steals, two rebounds, an assist and a block. Terry set career highs in field goals and free throws made, while matching career marks for 3-point field goals made and steals. Deyo registered her first ever double-double, as she set career highs with 16 points (6-9 FG, 1-3 3-FG, 3-10 FT), 13 rebounds and three blocks. Junior Brianna Camara (Fall River, Mass.) was also in double figures for the Penmen with 12 points (4-9 FG, 1-5 3-FG, 3-3 FT), five rebounds and four helpers. Foul trouble hurt the Penmen, however, as junior Kylie Lorenzen (Holliston, Mass. ), Camara and senior Catherine Stinson (Lynn, Mass.) were all limited. Jess Camarda scored a game-high 29 points for the Panthers, while Niajah Morgan (15 points, 12 rebounds), Simone Hobdy (14 points, 10 rebounds) and Natalie Fekula (11 points, 10 rebounds), all secured double-doubles. Deyo scored the first four points of the game, as Southern New Hampshire built what would be its largest lead of the contest at 8-3 less than four minutes in. Adelphi hit back with a quarter-ending 20-5 blitz – with seven points from Hodby and five from Fekula – that handed it a 23-13 advantage. A Hodby basket at the 4:47 mark put the Panthers in front for good at 9-8. 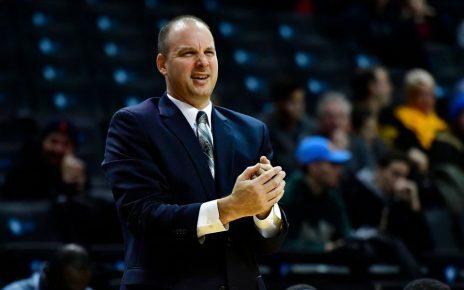 Adelphi opened the second quarter in nearly identical fashion to the way it closed the first, ripping off an 18-5 run – with 12 points from Camarda – to clamp down a 41-18 lead with 4:30 to play before the break. SNHU answered in a huge way, as Terry scored the first 10 points during a half-ending 16-3 run that slashed the deficit to 44-34. The Panthers would increase their lead to 15 in the third quarter, but in the end, the margin landed back where it began at an even 10 – 62-52 – going to the final frame. A layup from freshman Gyanna Russell (E. Hampton, Conn.) opened the scoring to bring the margin into single digits for the first time since the opening quarter, before Terry nailed a 3 that made it a five-point game at 62-57 with under eight minutes to play. An 8-2 run from Adelphi pushed the lead to 11 before a three-point play from Camara and another trey from Terry pulled the Penmen within 70-65 with 3:15 on the clock. That was as close as Southern New Hampshire would get, however, as the Panthers went 6-for-8 from the line to seal it. Lorenzen, who fouled out with under three minutes to play, tallied eight points (4-8 FG), three rebounds, two assists and two blocks. Russell posted seven points (3-8 FG, 1-1 FT) and a pair of assists. 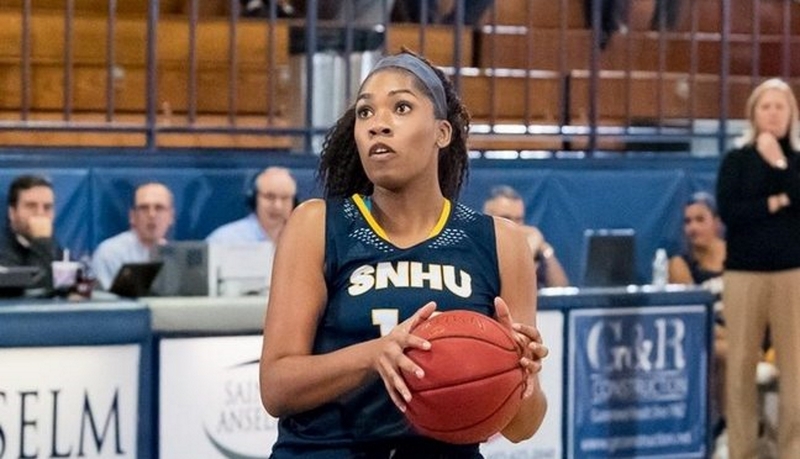 The Penmen return to action Saturday, Jan. 27 (1:30 p.m.) when they play host to the University of New Haven at the SNHU Fieldhouse on Pink Day, in a game that will air live on FOX College Sports.